The Wales Millennium Centre opens to the public on Friday 26 November after over a decade of plans, arguments, new plans and funding wrangles. The building, nicknamed the "armadillo" by some locals, has cost a total of £106m, and has attempted to represent the country at large by using materials from around Wales in its construction. It will provide a new home for seven arts companies, including the Welsh National Opera, the Welsh youth organisation Urdd Gobaith Cymraeg, Diversions Dance Company and disabled therapists the Touch Trust. The building provoked controversy early on after a design for an opera house submitted through an international competition by architect Zaha Hadid was rejected amid accusations of elitism. The building has been funded by a combination of lottery money via the Millennium Commission, the Arts Council of Wales, the Welsh Development Agency, the Welsh assembly and the private sector, including a £10m donation from South African businessman Donald Gordon. So is the money worth the result? See below for a selection of your comments. This Have Your Say is now closed. Such iconic symbols, like them or not, enable us to imagine national identities, and from national pride and a sense of ownership (which is up to us as individuals frankly) we can achieve anything and everything for the sake of all Welsh people, wherever they are. We all have to start somewhere. PS never seen an armadillo, or any animal come to that engraved with any letters. A horrible piece of parochial Welsh architecture and poor urban planning that aptly represents the exclusive nature of the Welsh elite at the expense of all others. It really is beautiful at night. The lights through the windows. The words both English and Welsh appear to be floating - stunning. I think its sheer scale and design will bring in many extra visitors to wales, as for the north Walian moaners. It would be a guaranteed flop - if you put it out in the sticks. An ambitious, innovative centre like this needs good rail, air, and road links to be a success. You have to speculate to accumulate and I'm sure the tourist benefits to the country as a whole will be great. A horrible piece of parochial Welsh architecture and poor urban planning that aptly represents the exclusive nature of the Welsh elite at the expense of all others. Take away the M4 and you have nothing dreamers! I'm very much in favour of the new centre. It's about time Cardiff became more about culture than drinking culture. I understand all concerns about it being positioned in Cardiff rather than the north, but the simple fact is that the majority of the popultion live in the south - pure economics. As for those whose think it is purely to pander to the elite - you're wrong. I'm not one of the "elite" but I'll be going - if that's what you think just stay at home and read your TV Quick for articles on Eastenders. Places like Paris, Barcelona et al, offer culture and interest, don't you all think it's about time that we do too? Or would you like more pubs and more violence that's associated with it on a Saturday night? Whinge whinge whinge. I cannot believe the attitude of some of the naysayers on here. "The money should have been spent on buses" etc. Well, it hasn't. Deal with it. Cardiff now has a better venue than anything on Broadway NY. A striking architectural vision and another bold attempt to rejuvenate the bay area, which despite the rose-tinted nostalgia of some, was a festering, crime-ridden waste ground. Nice and cheap - however still a waste of money. Wales is a predominantly uncultured place. Any attempt to prove otherwise is a joke. I am a native of Cardiff, but moved to London when I got married some 20 years ago. I cannot express how proud I am to say I come from the city. The changes over the past 20 years have been phenomenal culminating in the opening of this fantastic building. I wish everyone connected with running it all the best for the future and I hope the people of Cardiff and Wales generally will be proud to have such a centre in the city. As an opera lover I welcomed the project, but the exterior design is awful and the auditorium is likely to prove too large to fill for all but the most populist performances. Long term I suspect this will either be expensively tax-subsidised or will have to change its core appeal to include business functions etc. Nice and cheap - however still a waste of money. Wales is a predominantly uncultured place. Any attempt to prove otherwise is a joke. I can guarantee that this building will simply become a convention center for Welsh language extremists - holding Urdd Opera sessions in an attempt to show that, yes, they are cultural superior to us, the English speaking majority - whilst at the same time laughing at our expense. Surely we could have done something more culteral relevant - like give Swansea or Newport a proper conference center so we can hold events - like most other modern towns/cities seem to be able to. Brilliant looking building and can't wait to attend the five shows we have already bought tickets for, fantastic to be able to watch the WNO for only £10! Little concerned about parking though, who thought it was a good idea to build this massive new building and not add some additional parking to an already tiny amount in the bay? As I'm next door neighbour to the new Wales Millennium Centre I thought I should say how fantastic it is! I love the design and think it brings a new charecter to the bay! Great job everyone - can't wait to get inside! Looks fantastic from the pictures!!! I live in Cambridge, and I just hope that someday the powers-that-be will be so enlightened to build such wonderful architecture and cultural venues. Cambridge is so poorly served. It looks wonderful in the photos. Having lived in Cardiff for many years previously, when asked by people whether the city is worth a visit, I have to say only if its for a match at the stadium. It's good to see that Cardiff now has capital-class arts centre to recommend it too. Just one question why Millennium Centre, couldn't there have been a more original name? It should be called the south Wales Millennium Centre. It is totally irrelevant to us in north Wales. I was born in the maternity unit a few miles from this thing. I watched it being built from the offices I was working in across the road at the time. It looks like the "cargo shuttlecraft" used by the "system lords" in Stargate-SG1 and I believe what goes on inside will be equally alien to me. It was built without any of the locals being asked whether they wanted it or not. It will be opening without any additional parking provision and Cardiff Bay is plagued by useless public transport provision. £106m would have been better spent on something Wales needed, rather than something to pander to the elite. It does look like an armadillo or a decapitated tortoise. A very impressive building, give it a chance and see what various types of work that they put on there then we can all make a realistic judgement. I hope it is a success for everyone's sake. With good marketing, the right entertainments manager and a positive attitude we can do this. Entertainment must be affordable to all and target all age groups. Cardiff can do this! Having seen some of the stages of development and now seeing the completed building on TV I can't wait to go there - I think it is a wonderful building and a grand bold venture. There is a real passion for live theatre and music in south Wales and this is a fabulous expression of it. Now how about being upbeat and positive instead of making the first news I have seen about this on my internet newletter a depressing piece about how it might fail! Yes, it is a challenge - but if we never did anything challenging we would (as my Welsh father used to say) still be living in caves. When I first moved to Cardiff 15 years ago the docks were a derelict wasteland. The whole city is now unrecognisable from those days. The WMC is true to the real traditions of Wales, not the penny-pinching that we see now. This is the last of Cardiff Bay Development Corporation's great projects and I feel proud that the whole world will soon see what my city and my country can do. Every day I thank the Lord I'm Welsh and from Cardiff! I cannot believe the negative views of some of the philistines who've expressed their grubby opinions here. These people are supposedly Welsh yet they are the enemies of Wales. Why would they seek to deny Wales a world class facility facility of the arts? Are they content for Wales to continue to be a laughing stock in England and unheard of in the rest of the world? This is our chance to show the world that Wales is an international class country - and it's a golden topped opportunity to demonstrate what communal talent we are capable of. And what is all this whining about the cost? In hundreds of years, the WMC will be standing as a proud icon of Wales in the 21st Century. You people are pathetic - get yourselves an ounce of vision. The writing on the outside of 'the copper slug'; what does it say? At school I was taught that sentences started at the left and finished at the right; or perhaps it is a puzzle in which the public has to find the words and put them in the correct order. Lucky Cardiff! I cannot understand why we English cannot join in the celebrations. I have looked in vain for TV coverage. Was it just the Welsh who paid for it? Why does Wales have to be so pessimistic? Let's embrace this wonderful centre and support it; so long overdue I certainly can't wait to visit. I hope that it will be able to attract the best performers so that we don't have to visit London to do so. This will (should) be great for Wales... in so many ways, put us on the world map for having something special to attract all. If the people living here can't be proud and have confidence rather than negative chatter it will fail. Might last longer than the dome. I think the WMC is absolutely fabulous and all of Wales should be proud. The external is more than impressive and can't wait to visit. I think it's fabulous! Looks great and is perfect for a modern capital. Well done to everyone concerned. £106m sounds like a lot but not in this day and age!! A fantastic building and facility that deserves support. However, it's now time to invest in the rest of Wales - Cardiff has had more than its fair share. Fantastic building! We've already bought tickets for a performance in the first few weeks and intend to buy many more. Great building, a pity about the no parking. How are we all to get there as I make out there will be about 1,000 cars for every full performance. Like all things in Cardiff, are we are supposed to walk there even the disabled like me? Architecturally the Millennium Centre (catchy name huh?) is parochial and the opportunity to build a truly world-class building in the bay has passed by. The Guggenheim effect - that put Bilbao, a less lovely city than Cardiff, squarely on the tourist map of Europe, has been denied to the city by lamentable local politicking. Ironically Zaha Hadid had designed such a building. It looks spectacular. You really have to be there to experience the magnitude and beauty of it. Cardiff Bay is now one of the most interesting places to visit in the UK and I'm sure when the WMC opens it will do very well. Yet another world-class venue (albeit a hideous one) for the South! It could not exist without the massive subsidies poured in, yet we in the North just have to put up with it. No doubt it will make a splendid companion piece to that other publicly-funded carbuncle, the new assembly building. Fantastic building! We've already bought tickets for a performance in the first few weeks and intend to buy many more. It's about time Wales had a venue which is open to all and a team whose mission is to bring inspiring theatre to Wales. It's much needed and much wanted by lots of people, We'll no longer have to travel to London for great and different theatre! People from north Wales go to Liverpool/Manchester... people from mid Wales go to Shrewsbury/Birmingham... no one will go to Cardiff.. The money should have been spent on things that would help the population and not on a tourist attraction. Until recently I lived in Cardiff and have had to move for work. I was really looking forward to this being open, and the possibility that the BIG shows could come to Cardiff, and to knowing that our own home grown renowned operatic company (WNO) would have a home stage worthy of them, and now I'm going to miss out on a lot of it. Whatever else it may look like, it's beautiful in the way it appears to be different colours in different weather and at different times of the day. It might not be a hospital, or a bus service, but it offers Cardiff a chance to maintain Wales' place as a cultural hot spot. It's dark, ugly and depressing. As long as this assembly government's around I think it represents Wales' future. £106m. We do not have an evening bus service in Llandaff North, Cardiff. I for one give it my full support and have already purchased eight tickets for two shows in the new year. The people of Wales must unite and be thankful we have such a place to be proud of. Cardiff is a great and up and coming City, We have arguably the best stadium in the world and now the best theatre. Be proud of your culture. The problem with Cardiff is the majority of people hate change and are pretty short-sighted. It's no wonder that this project has gone ahead regardless of local opinion as many inhabitants seem to look for an excuse to complain. Cardiff Bay is becoming a fantastic place, but negativity and wet thinking has been the cause of progress dragging its heels over the past few years. Llongyfachiadau! I'd like to congratulate all involved in building this wonderful and inspiring piece of architecture. I cant wait to make the journey down, shame it's such a nightmare driving from north to south Wales. People from North Wales go to Liverpool/Manchester..people from mid Wales go to Shrewsbury/Birmingham...no one will go to Cardiff.. I think this is a great asset for Wales, but I agree with others on this page, that it is now time to start investing in the rest of Wales, otherwise, soon in an encyclopaedia somewhere it will say "for Wales see Cardiff"! Is this the ugliest building in Wales ?I think it is. Let's hope the quality of performances inside can make up for it! It looks like an enormous woodlouse but at least it's original. What a monstrosity the Millennium Centre is. Talk about a blot on the landscape. I cannot see it lasting more than a couple of years. Having been lucky enough to see inside the centre I have no doubt that everyone who sees the Donald Gordon Theatre will fall in love with it. Its looks fantastic. People who complain about the cost are too short-sited, as the tourists, developments and attention the centre will attract over the next few years will be of huge benefit to Wales. Another example of the assembly wasting public money on the capital city whilst the rest of Wales goes without. Has devolution actually benefited anywhere apart from Cardiff Bay? Great venue, let's hope that people support it. Does anyone else think it looks like an armadillo on the skyline? The WMC deserves to be a success. If Cardiff ever hopes to achieve the international standing to which it aspires, ambitious, exciting projects such as this are essential. Cardiff has so much potential, and rightly won't be held back by "doom-mongers" such as Joel Marshall who, it seems, would be happy to consign us to mediocrity. Cardiff does not need a building like this especially one costing £104m! There are far more pressing issues that the money could have been used for, the NHS for one! I think someone should also tell them that the Millennium was for years ago! Stop wasting our money! It's an ugly eyesore. Where's the parking for visitors? Why do we have to call such a wonderful building The Millennium Centre? Surely something more appropriate would be more suitable. Can you imagine The Sydney Opera House having such a bland name? The Millennium Centre makes it sound like a scout hut!!! Not the nicest of buildings. The "golden armadillo" (as a few of us like to call it) dominates the skyline. The text on the front is difficult to read as it isn't written in lines but is vertical! Quite confusing!!! The contrast between the slate and gold panels is horrific. Apart from the slate looking like a oversize pebble dashed wall, the armadillo looks like... well... an armadillo!! I actually work in Cardiff Bay and it has been amazing to watch the building of the Millennium Centre. I think it is world class building and I cannot wait to attend one of the shows to be held there. It looks great, I hope that they put a wide variety of programming on. I will make sure I will visit in the first year, hopefully more times after that!!! I can't believe they can build such a place without any thought to parking especially disabled parking close by. Absolutely fantastic! The WMC will help Cardiff develop even further as a modern, cultured and progressive city. The centre's appeal stretches through all ages and classes of society. I'm 23 years of age and have never before had any great desire to go to the theatre for plays, operas or musicals. However, with such a great venue in Cardiff I'll definitely make use of the facilities. regularly. A wonderful asset to Wales. People who have concerns about the cost must remember that the centre was part funded by the Millennium Commission and so has brought millions of pounds into Wales, that we would not have gained otherwise. This was an opportunity too good to miss! If it had not been built, the funds would simply have disappeared within the system and Wales would have been left with nothing! Can't wait to visit. The interior is truly awe inspiring, beautiful! Why are people always so negative? There is, however, one small gripe more advertising let us no what is happening I live in Thornhill, Cardiff and as yet have not had any literature telling me of forthcoming events. That I am sure would be appreciated. We've got a new white elephant, which will require propping up by the assembly, draining away public resources for years to come. We've already got St David's Hall - the two can't both survive. The people at large wanted their swimming pool back, not this financial black hole of a building. I'm absolutely thrilled with the new WMC, and have already bought tickets for a number of productions. I love living in a city that thinks big, and gets things like this done. It's just a shame that so many local people still don't realise how affordable and accessible this place will be. Hopefully that will all change soon. Hope the inside looks as good as the outside. It's a great statement to the rest of the country/world showing that the people of Wales aren't just interested in sport! I hope it's a major success. 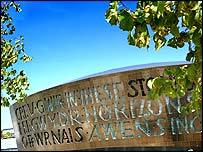 I live very close to the Millennium Centre and think it is a stunning building and an excellent landmark for the city. Cardiff people should be pleased to be able to see such good shows on their doorstep. I think it's fantastic that we have such a wonderful building in Cardiff that we can go and watch world class shows. It's only what Cardiff deserves as a capital city and to compete with other cities in the U.K. and the world. I live in Cardiff and I think it's a wonderful building with the roof that changes colour in the day. I will be looking forward to seeing the ballet later next year. I'll be travelling down from Scotland to see WNO's "Wozzeck" next year. The people of Wales should be very proud of this building.